Available from Lhara at the darkmoon faire for 180 Darkmoon Prize Tickets the new currency for the updated Darkmoon Faire. So happy that there is a screenshot now. I CANNOT WAIT FOR 4.3! Modeled after the Plainstrider mobs in Mulgore/Barrens with a different skin. 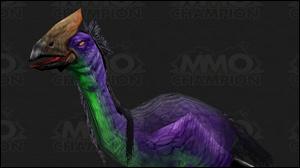 At 180 tickets, you'll be able to get this mount within one week of the Darkmoon Faire. Crafting quests (4 tickets each for primary professions, 3 tickets each for secondary professions). Test Your Strength for 10 tickets. This means you can potentially get 205 tickets per Darkmoon Faire week. You'll actually be able to attain 180 tickets in six days if you finish Test Your Strength, all of the crafting quests, and all five dailies every day. So did anyone else come to look because they misread it as spider? Just got it on live - It shares animations with hawkstriders, aka idle animations and runnings. The Darkmoon Dancing Bear dances (literally), this mount does not. I am totally picking the bear first. Finally got one of these glorious mounts on my tauren paladin. So wrong, yet so right. It shares all animations and sounds with the hawkstrider mounts, which is a bit disappointing, even though they are pretty awesome. Is there any possible way to get this in that first week? According to MMO Champion, this is currently the rarest mount in the game! I've just received this little beauity. It's a really cute mount, and will be quite rare, seeing that the majority is getting their dancing bear first. However, the legs clip terribly at the neck / wings area. Especially If your character is wearing a kilt, the dress goes right through the mounts neck. Here's to hoping that blizzard will look into this. Pretty simple to get within one week of the DMF , I got it the first week of DMF on the PTR very simple to get. Soon I shall be a giant wolf riding a giant plucked chicken!, but now I am a giant cow riding it. Being a hunter who likes to match her mounts, pets and/or companions, I'll be getting this little guy as soon as possible: purple tallstrider. This is the rihanna of the hawkstriders, Bruised beat-up and plucked! Does it make any sense that I think gnomes are perfect for this mount? should i buy this, or the Darkmoon Dancing Bear? OK guys get this failure. I got on with 83 tickets. I logged out with 178 Tickets. Coming in Patch 5.1, there are plans for a small companion version of this mount. The Darkmoon Hatchling, Darkmoon Hatchling (item will exist when 5.1 drops) is planned to be added to Lhara in exchange for 90 Darkmoon Prize Tickets. Does this mount not count towards We're Going to Need More Saddles ? I was one mount away before learning this mount, and it didn't trigger the achievement. Edit: Odd, I guess closing WoW fixes it, if my mobile armory is to be believed. Is this actually a swift mount? "This vibrant breed can only be found in the forests of Darkmoon Island."